Working with a center line, whether vertical or horizontal, challenges the painter. How do you prevent this thing from becoming static? How do you overcome the invitation to symmetry? How to you create movement? In this painting the challenge is heightened by the choice of black vs. white. Now look what happens at the dividing line between the two fields. At (2) a large round shape that straddles both fields attracts your attention by virtue of its size, circularity and texture—it’s glued on burlap. At (1) and (3) lines cross the divide. These are powerful because the eye finds lines irresistible and traces them wherever they lead. The blue line at (3) gracefully sweeps upward towards the right. At the light red dot (4) it traces an orbital path. Because the red rectangles at (6) suggest a stable architectural element (perhaps a window), they add a rational anchor to a universe in which amorphous planes float randomly. At the same time the red dot perches precariously on one corner (4). This becomes the focal point of the painting, deeply satisfying and at the same time restless. But wait, there’s a twist in the plot. 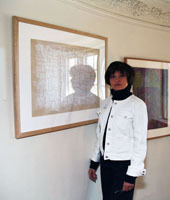 When the artist submitted the painting to the Studio Exhibit she reversed it. Notice that the focal point in this new orientation is one of those amorphous shapes (5). The effect is edgy. We are deprived of the satisfaction we found previously in the red dot perched on the corner of the red rectangles. In this orientation, the red dot and the red rectangles are resting on the bottom edge, not going anywhere. They’ve settled, they lack drama. It’s a brilliant painting. Buy it. Hang it, not over your couch, but in front of it. Sit. Look at it in one orientation, then next week turn it over and look again. Allow yourself to be unsettled. Get to know your perceptual quirkiness. The Studio Exhibit at the Evanston Art Center will be up til January 29.